This page is dedicated to those dogs that have been successfully re-homed through all the hard work of Ros Dyer of NNC Welfare. This is M who came into Welfare because she was too much of a handful for her family with a new baby. She was happily rehomed just before her second birthday and has begun to calm down as she matures. This is K who came into Welfare when his owner died. K required a lot of veterinary treatment before he was adopted, and now lives a very happy life on a farm. 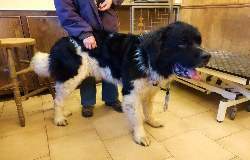 This is D being groomed prior to being rehomed. 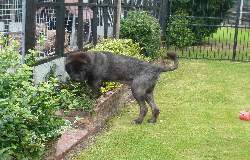 D was only 11 months old when she was returned to her breeder as too boisterous. 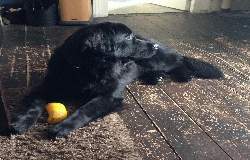 With time, patience, lots of exercise and training, D is now a delightful young dog. This is O who lived in a field for many years until we rehomed him. 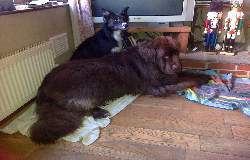 He now lives with his best friend and a loving family in a perfect Newfie home! This is C who is nearly 11, and one of the oldest dogs we have rehomed. He was in a very bad way when he came into Welfare, and needed to be completely clipped off in order to groom him. He also has no ear flaps, but is still a very handsome lad! C is living out his days in a loving home where he will never go hungry or be hurt again. 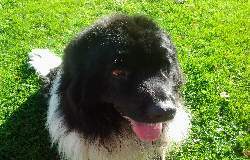 This is K, another older newfie we have rehomed. 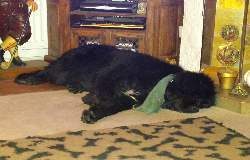 She came to Welfare aged about 7yrs with some behavioural issues, but has developed into a great dog in her new home. This just goes to show that even problematic dogs respond well to plenty of kind but firm training and consistent rules.